I had a great time at the 2015 Houston Stamp Show held September 18-20 by the Houston Philatelic Society at the Humble Convention Center. This year's show was better for me than in the past, because earlier this year I joined the HPS and for the first time I volunteered to work. "Right," you say, "Volunteering to work sounds like so much fun!" Well, in truth it was just that, FUN! My assignment: the Beginner's Booth. I had the privilege of working with many long-time veterans of the show and had a chance to discuss my hobby with many like-minded collectors. I wish there had been a few more kids stopping by, but the few who did received the royal treatment and left with a generous amount of free stamps and supplies. We had lots of great material at the booth. Another thing I learned was that working the Beginner's Booth also included the added benefit of being able sift through loads of less expensive material that you normally wouldn't find at a dealer's booth! So, inevitably, I left with a bunch of treasures (or trash, depending on your perspective) purchased at extremely reasonable prices (10 covers for a dollar, for example). 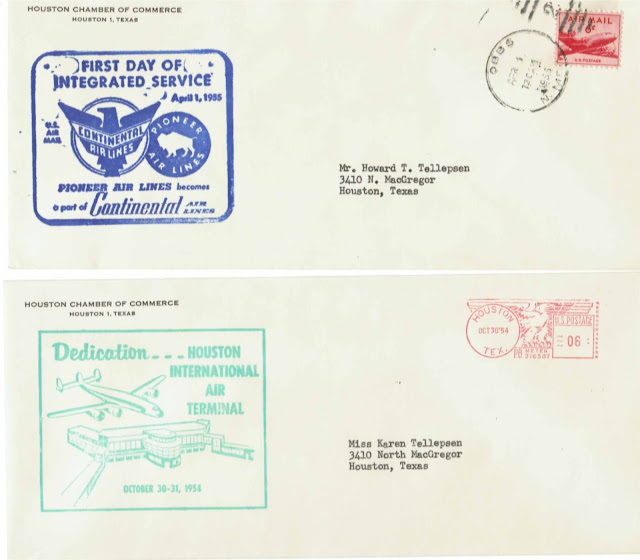 Among the items I picked up, two of my favorites are a pair of covers related to the airline industry in Houston. One marked the October 30-31, 1954 dedication of the Houston International Air Terminal (IAH), and the other marked the first day of integrated service of Pioneer Air Lines with Continental Air Lines. I especially liked these covers because I worked for Continental for a few years. Some things have changed over the past 60 years. The Houston International Air Terminal is now known as George Bush Intercontinental Airport Houston, but still retains the IAH designation. And, of course, both Pioneer and Continental are air lines of the past. Over the years, Continental continued to grow and the eagle logo on the cover was eventually replaced. In 1991 Continental adopted the familiar blue globe logo that became the logo of United Air Lines after the two merged in 2012.